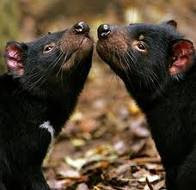 Tasmanian Devil (Sarcophilus harrisii), or in the Indonesian language "Tasmanian Devil" is an animal carnivorous marsupials now found only in the state of Tasmanian island, Australia. 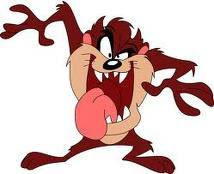 The Tasmanian Devil is the only member of the genus Sarcophilus surviving. The size of these animals with a small dog but stocky and muscular body. 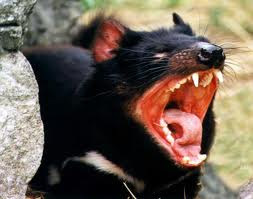 The Tasmanian Devil is the largest carnivorous marsupials in the world who have cirri fur color is black, a strong smell when it is frightened, his voice very loud and annoying, and its dangerous when you are caring for their children. 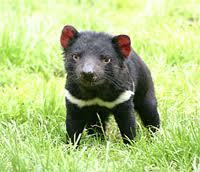 Tasmanian devils are known as hunters and animals eat the remains of other animals. 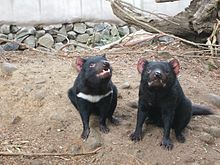 Although usually solitary life, he sometimes ate together with other Tasmanian Devil. 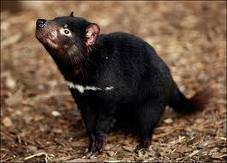 Tasmanian Devil became extinct on the mainland continent of Australia about 400 years before European settlement in 1788. 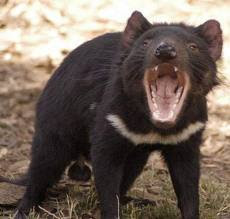 Since it is considered as a threat to cattle in Tasmania, these animals were hunted until 1941, when they are officially protected. 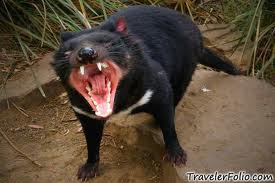 Since the late 1990s advances tumor disease has reduced the population drastically and now threaten the viability of this species which may soon be included in the list of endangered species. 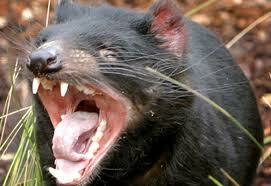 At present various programs conducted by the Tasmanian government to reduce the impact of this disease.